Little White Books gave us a huge surprise and started 2016 off with a bang!! 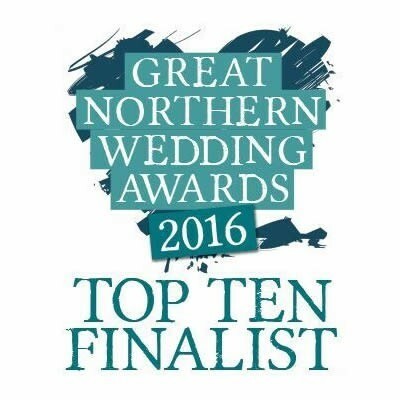 We’ve made Top 10 finalists for two categories, both Makeup and Hair in the Great Northern Wedding Awards for 2016. To think I left Cassie Lomas Makeup Academy 4 years ago and now here I am. I’m so proud. I spend ridiculous amounts of time keeping up to date with trends, taking further training to develop skills, run my website and blog as well as ensuring all my social media accounts are constantly updated. Not to mention ensuring all my new brides to be are happy as well as keeping updated with previous brides to see how they are getting on with married life. Having said all this I love it, I wouldn’t change a single thing – This isn’t work for me. 2016 is going to be a hugely exciting year. This year is about brand development as well as exceptional service to all our clients. I am itching for Wedding season to start! Great Northern Wedding Awards 2016 now has open voting for each category to find the final 5, the finalists are then invited to an Awards ceremony at Beeston Manor later in the year to announce the winner. I’m so thrilled to be in two categories. I have Sam to thank for the hair side of things for all her hard work in 2015, we had a fantastic Wedding season and made some forever friends, a number of whom are now expecting little bundles of joy. If you have been a bride of mine for Makeup and/or Hair (this includes past, present and future) you can cast your vote now. We have a great category with some respected names in the industry so it’s a pleasure to just be beside them. We would really appreciate you taking 2 minutes of your time to vote for us. All you need to add is your name, email and wedding date then vote for us! !